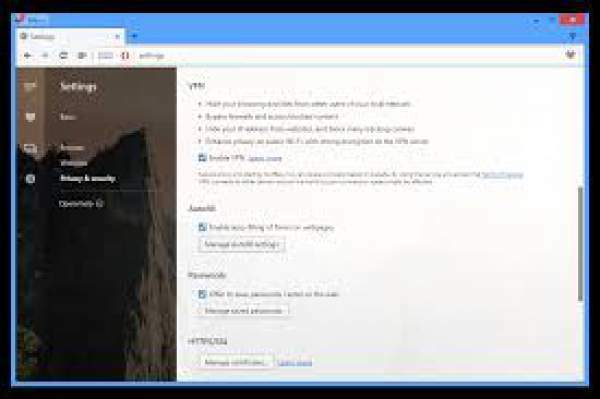 Best Free VPN Services: If you have been wondering, which VPN server / tool to choose from, among tons available online, here we are to help you with your problem. We have assembled a list of free top Virtual Private Network service providers available and now here we go. We have assembled a list of top VPN service providers available and now here we go. 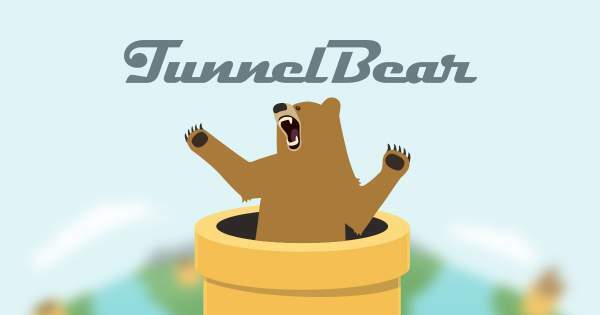 It’s the best VPN service for both Windows and Mac OS in terms of speed, privacy, and unblocking. ExpressVPN has got over 2000 servers at more than 148 locations with over 30,000 IP addresses. And its plan can be used on up to three devices. It also comes with a wide range of secure VPN apps. Other features include 24/7 live customer support, ultra fast VPN servers in 94 nations, and offers 30 day money back guarantee. It has got excellent tailored clients and offers a great experience for both mobile and desktop software front. It is supported by all the major platforms – Windows, Mac, Linux, iOS, Android, and even BlackBerry. You don’t need to setup routers every as they do their own firmware automatically. It comes with VPN browser extensions, and DNS content unblocking for all streaming media devices and Smart TVs. On the whole, it’s a very extension VPN solution for all. The users get P2P support, a kill switch, and very good performance levels. So, overall it’s a reliable service with a premium price tag with ultra fast and highly secure provider. It surely was the best choice of our testers with the speed hiking generally up to at least 4 Mb/s and assuring us that it doesn’t limit bandwidth for free users. As usual, this one comes in both the free and a paid premium version. According to its official website, CyberGhost has got its servers in US and UK along with a plethora of European nations. Even some of the Asian countries are covered under their banner. 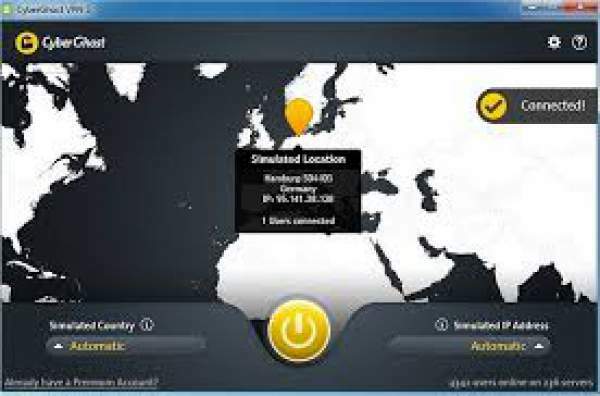 If you are using it no bucks, then you will have access to at-least 14 of these servers and you ought to go for the premium membership if you want to choose from a range of 24 countries. The speed is healthy enough to let you stream SuperHD Netflix videos, without any lag, provided that your internet connection is efficient enough.Now let’s go to the other side of the coin. The biggest drawback is that you can have a continuous session of maximum 3 hours at stretch and would be logged out after that. Even though logging again doesn’t take more than a bunch of seconds, it becomes cumbersome if you are in middle of your important video conference with the guys at work. Again, you will have to become a member to avoid this complication.Next in line is the predicament for iOS users. You can’t use the iPad apps with a free account. So, consider it a completely paid tool if you have got an Apple device with you. So, just go for it! This is another efficient option to vouch for especially if you are traveling in Asian countries. It comes with really good download speed and is fast enough to initialize. The free service gives you 500MB per month although you can request an increase to 1GB via Twitter. With the paid version, you are free of these limits and can browse without any restrictions at all. Worth spending every buck!You get to use servers in US, UK, Canada, Germany, France and Japan and an additional Australia if you have got a membership. And for a membership, you can either choose to pay monthly or annually, whichever deemed fit. What sets this one apart is its price catalog. To start with, you get a trial period of some 100 MBs. You must be thinking, is it some kind of joke! Seriously just 100 MBs? I mean you will hit the end even before you actually get started.But the interesting part comes up now. After the trial, you just pay for the amount of data you need. You get a wide variety of plans to choose from, ranging from 50 GBs to 5 TBs. And you can use it all up without any limitations of the number of devices using it. To make the deal even better, there’s no time limit on which to use the data. Currently, you can choose a server from USA, Canada, UK, Netherland or Switzerland. 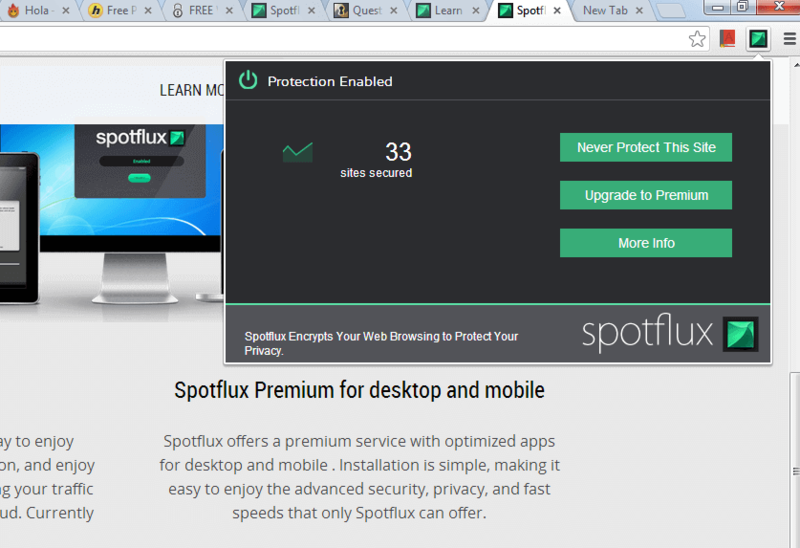 The biggest advantage of using Spotflux is that you also get this tool as an add-on for Google Chrome browser. This simple fact really makes the life a whole lot easier. 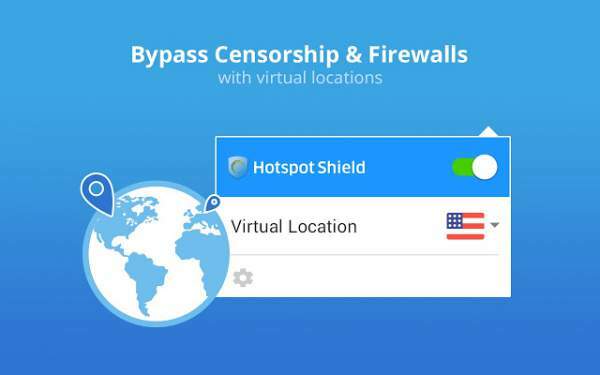 With this add-on, the VPN will operate when you’re browsing, but not in other internet-related applications including Skype for which the Virtual Private Network approach isn’t recommended. So, gone are the days when you had to switch on the VPN just for a small task and close it again as soon as you switch between applications. Like many others, this one also is available for iOS users with the restriction being that you will have to gain a paid membership. With that, you get the privilege of having phishing protection and an ad-blocker working round the clock for you.When it comes to the department of speed management, it offers quite satisfactory stats of at-least 6Mb/s. This service has got its servers in the USA only though! That’s a downer. This is another popular option to go for if you are traveling in Asian sub-continent. Hotspot Shield’s paid version comes with an unlimited tag, be it the data usage limit or the time period itself.So where is the catch?To start with, this tool’s free version is funded by advertisements which are unfortunately not controlled by you. In fact, many of the users have reported obtrusive and abusive content in such ads.Another drawback is that even though these guys have got servers in UK, Australia, and Japan, you get to go for some random US server only if you are a free user. Other, options are supposedly for paid users only. So, you surely won’t be able to access to the UK only content.Other than that, the speed was good enough at more than 6 Mb/s. here comes a name which surely everyone has heard of. After all, who hasn’t used the services of the red circle on their basic Java run phones!The latest version, which is currently available under the beta version, comes with an inbuilt option of browsing through a VPN client. This is not an add-on and is completely integrated into the browser itself, which makes it even more efficient tool to go for. So, using this, you get to have no limits on data usage or the time period at all. Everything for free. The perfect solution! The program is still in Beta mode, that is, it is still under construction, but users can already start using it. You get to select from servers from the US, Canada or Germany, and the speed tests are also very satisfactory. To use the feature you have to go to the O menu, then Settings, then Privacy & Security and toggle the free VPN on. So, this was our list of Best Free VPN Services. What’s yours? I have used Hotspot Shield, Cyberghost, Zenmate, Hola, TunnelBear, PureVPN on my PC/laptop and OperaVPN on my phone. Now using Ivacy on both for more than a year now. I don’t know, I could never trust free services as I always keep wondering from where do they get the income to keep the business alive? I’m still in search for the best VPN service, so I already tried a bunch of them. Yesterday I purchased Surfshark VPN. Reviews say that it has fast, not loaded servers because the service is still very new. Will see how it goes.